Deferred maintenance, faulty decisions by controllers and the pilot of a fighter jet contributed to an aircraft’s fatal crash into a San Diego, California, neighborhood in December, the Marine Corps announced Tuesday. The commander of the fighter squadron involved in the crash, its top maintenance officer and two others have been relieved of duty as a result of the crash investigation. The pilot has been grounded pending a further review, Maj. Gen. Randolph Alles announced. Nine other Marines have received other disciplinary action, Alles said. The December crash killed four people when the F/A-18D jet slammed into houses about three miles from the Marine air base where it was attempting to make an emergency landing. Learn more about the jet » Dong Yun Yoon lost his wife, children and mother-in-law and another unoccupied house also was destroyed. Yoon said the victims were his daughter Rachel, who was born less than two months before the accident; his 15-month-old daughter Grace; his wife, Young Mi Yoon, 36; and her 60-year-old mother, Suk Im Kim, who he said had come to the United States from Korea recently to help take care of the children. In an emotional press conference in December, Yoon said he did not blame the pilot and urged the public to pray for him. “I don’t blame him. I don’t have any hard feelings. I know he did everything he could,” Yoon said at the time. “Please pray for him not to suffer from this accident,” Yoon said as he fought for composure. “He is one of our treasures for the country.” Yoon’s minister, Daniel Shin, told reporters in December that the Yoon family had moved into the house a little more than a month before. He said Yoon came to the United States in 1989 and had since become a naturalized citizen. Yoon works as manager of “a variety store — a store where they sell a variety of things,” Shin said. 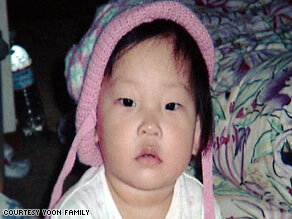 Yoon’s wife came to the United States about four years ago, Shin said. The pilot, who was the only occupant of the two-seat plane, ejected moments before the crash, according to the Marine Corps.